Allamanda grandiflora Poiret nom. illeg. Echites salicifolius Willd. ex Roem. & Schult. Echites verticillatus Sessé & Moc. A tropical twining vine up to 20 m tall, with milky sap (poisenous). The leathery leaves are mostly oblanceolate to elliptic-oblong, pointed, and may either be opposite or in whorls of three or four. The yellow, trumpet-shaped flowers are 5-7.5 centimetres in diameter; cultivated forms tend towards larger blooms which may also be white, purple, pink or orange in colour. Their scent may be described as delicate and fruity. The seed capsules are oval and prickly with winged seeds that fly about when the pod dries and breaks open. Originally found along riverbanks and other open, sunny areas with adequate rainfall and perpetually moist substrate. The plants do not tolerate shade, salty or alkaline soils; they are highly sensitive to frost. They have become naturalized throughout the tropics; they may be seen in roadside ditches, abandoned yards and dumps. 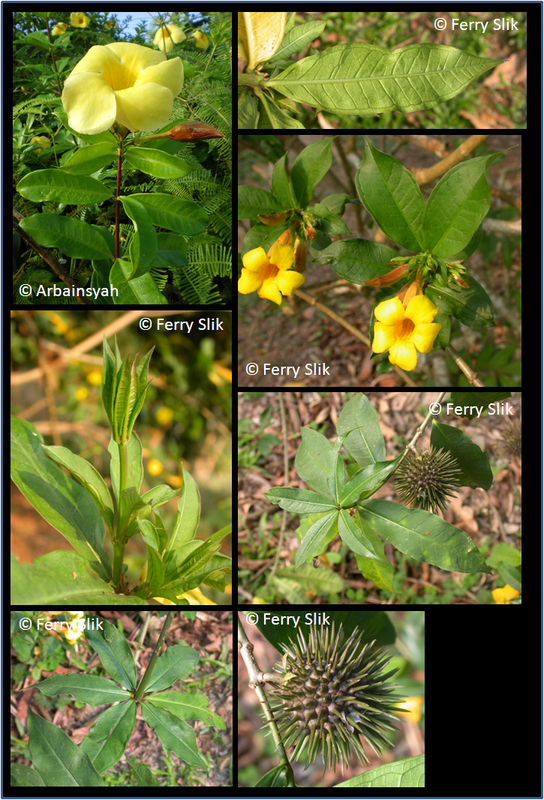 As a controlling measure, cutting is ineffecive with Allamanda and will lead to vigorous coppicing. Originally from the Neotropics, but now cultivated as an ornamental around the world in suitable climates. All parts are highly cathartic (hence the botanical name). The milky sap is also known to possess antibacterial and possibly anticancer properties. Gardeners exposed to the sap will develop rashes, itch, and blisters. Widely cultivates as an ornamental plant. It is used to treat malaria. Owing to its fast growth, Allamanda has been introduced widely where it is used as a groundcover or for hedges and screens. The roots are used against jaundice, complications with malaria and enlarged spleen. The flowers act as a laxative. English: Angel's trumpet, Buttercup flower, Golden trumpet, llamarada, Wilkens-bita, Yellow allamanda, Yellow bell. Indonesia: Akar Chempaka Hutan, Bunga akar kuning.